A clash of wills erupts in Valeska Grisebach’s interpersonal drama Western, making for a raw portrayal of the complexities of humanity. On a new job in the Bulgarian countryside, a group of German construction workers face new tensions, not only among themselves, but also with the local villagers who reside on shared land. This quiet village in Bulgaria is unsettled by the arrival of the workers and the hydroelectric plant to be built on its outskirts. Although the workers live in a camp separate from the village, tensions between them and the locals continue to rise. The only construction worker who doesn't seem to hold any contempt toward the locals is Meinhard. His calm introspective bravado aggravates his coworkers but allows him to befriend many in the local village, setting off a new thread of drama between the two communities. 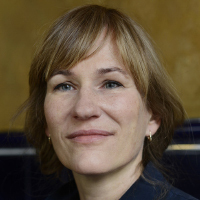 German filmmaker Valeska Grisebach was born 1968 in Bremen. She is a graduate of the Vienna Film Academy, where she trained in directing under Michael Haneke. She is known for Be My Star (’01) and Longing (’06). Western is her latest feature film.